Send a special delivery gift to celebrate a new baby. How about pink flowers for their new baby princess? Or a colorful collection of blue flowers for the new boy on the block? Send a baby gift that's as useful as it is beautiful: fresh flowers are a beautiful and colorful gesture, but let’s face it, they are a gift intended more for mom and dad than for baby. So why not include a gift designed especially for the newest member of the family? Your flowers arrive tucked inside an adorable and practical container, it can be used after the bouquet is gone to hold safety pins, pacifiers and other small nursery supplies, or to decorate baby's room. Order Teleflora's Ducky Delight gift complete with sailor's cap and bright blue eyes, is sure to get along swimmingly with the new family. The cheerful yellow ceramic duck adds childlike appeal to the nursery. Available with a pink ducky hat for a baby girl and blue hat for a little boy. Both include sunny spray roses, chrysanthemums, and miniature carnations. Order Baby's First Block by Teleflora. Available in pink or blue, it arrives spilling over with lively spray roses. This delightful glass keepsake is etched with the classic A, B, C pattern. Every parent knows that a successful future for baby begins with a solid foundation, help lay the groundwork by sending this baby gift today. NEW! Product will be AVAILABLE JUNE 2014. Send a pink or blue Sweet Little Lamb and bouquet, it is an adorable wooden lamb covered in soft fleece and filled with beautiful blooms and decorated with pink or blue ribbon. After the flowers are gone, the charming keepsake can be used to hold knick-knacks and to decorate the nursery! The wooden container has an attached rope and working wheels. Give baby a bouquet and keepsake in one! 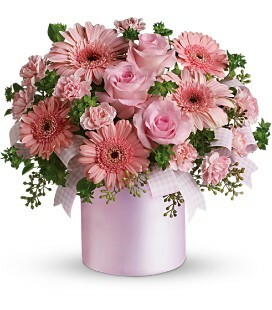 Teleflora's Lovely Lady pink bouquet is an ode to pink, bursting with spray roses and soft pink gerbera daisies. A symbol of innocence and beauty, Celebrate mom and baby with these feminine flowers. Stunning as a shower decoration, baby shower present or new baby gift, the arrangement pairs soft pink blooms with fresh greens in a shimmering pink vase. Available with "It's a boy!" or "It's a girl!" slogan. The Baby's Wow Wagon gift by Teleflora arrives overflowing with chrysanthemums, carnations and roses in vivid red, yellow and white. An enthusiastic slogan announces the stork's delivery. No childhood is complete without a bright red wagon, and this pint-size version is perfect for their new arrival. Not sure if it is a boy or girl? My Little Chickadee will be a welcome gift in the nursery - babies love bright colors. This bouquet features white and yellow flowers presented in a cute egg-shaped vase, complete with baby chick! The gender-neutral yellow bouquet also works great as a shower gift, if you aren’t sure whether it's a boy or girl! Don't forget the new mommy! 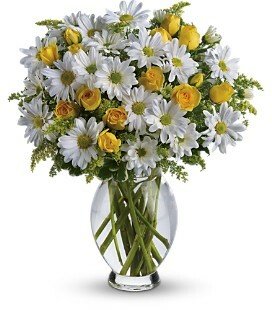 Teleflora's Amazing Daisy bouquet is a bountiful bunch of yellow and white daisies, flowers that have long represented youth and innocence. On a bedside cabinet or kitchen table, these simple wildflowers will be a cheerful reminder of her childlike side. She may be a new mom, but that doesn't mean she can’t feel like a kid again. Sleepless nights. Stretch marks. Endless diaper changes. All new moms struggle with their ever-increasing duties, and the best gift of all will convey a message of faith and love. The simple elegance of our Cotton Candy bouquet does just that, featuring white and pink roses, which not only symbolize love, but also gratitude and appreciation.